Olympia Time: What happened after we downzoned and the middle went missing in Olympia? But Olympia continued to grow. Where did all those people move? 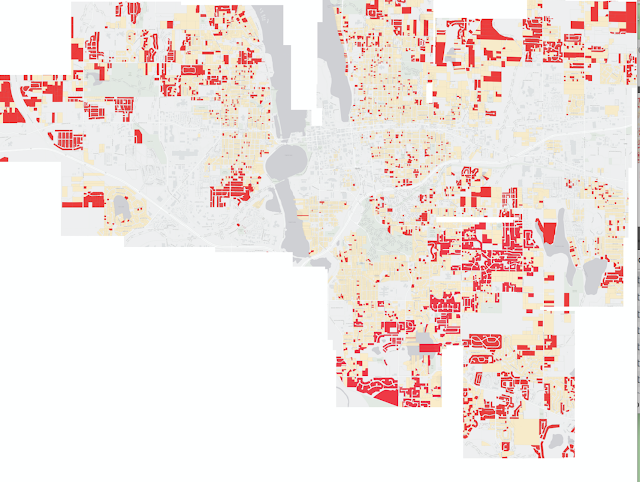 It seems obvious to point out, but they moved it mostly single-family zoned neighborhoods. More people came to Olympia, so if we weren't getting denser, we sprawled. This map shows every parcel that had a new structure in residential type (even including multi-family) after the 1988 downzone. I pieced it together from a series of webmaps from the Thurston Geodata Center. Instead of densifying the places where we'd already built, we expanded our footprint over the last few decades, cutting down more trees, paving over more open land. People continued to move into town, and as our interior neighborhoods "stabilized," new neighborhoods continued to be cut out of the woods and farms around Olympia. Here is the Google engine timelapse from 1984 to today, you can see the exact same thing. I hope this doesn't really need pointing out, but if we're worried about the impact of new growth or preserving natural resources, we would be concerned about sprawl. Again, not new news guys. Cities incur substantial expenses to build roads, transit systems and parks to enable development in a neighborhood. Downzoning automatically increases the per capita costs of all of those investments, because each road, park and bus line can serve fewer people. It also pushes additional development to the urban fringe, where some municipality must build entirely new infrastructure at high cost, and where not incidentally individual households will have to drive more, creating more pollution and congestion plus incurring more transportation costs. Ultimately, downzoning is a recipe for more sprawl: if you can’t build as many apartments, you’ve got to build more single family homes, and you’ll end up consuming a lot more land in the process. Even if the new roads and utilities we used to enable the post-downzone sprawl was paid for at one point with impact fees, we designed a system to fail. The impact fees only pay for the initial setup of these road and utility systems. Eventually, they'll reach the end of their useful lives and we'll have to pay to replace them. At that point, we've cooked into our zoning a limit on how many taxpayers will be on the hook to replace them. We're essentially pushing the expense of low-density, unwalkable single-family neighborhoods onto the next generation.